*Step 1: “Login”, “add to card”, “checkout”, “place order”. Lastly, Please upload at “Order Summary” section. However huge or small your business, business cards are Malaysia’s essential assets for network and promotional purposes. Creating professional business cards in Kuala Lumpur will better your probabilities of standing out inside a busy marketplace and provide you with an edge over competitors. Even with the rise of online marketing, business cards continue to play a vital role in establishing and growing a company, or simply towards your title out there if you are a person working freelance (ie: insurance agents, real estate negotiator). A good business card will supply the right first impression, hence making business card design an important consideration for success. 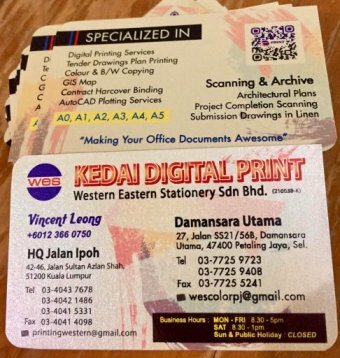 Western Eastern Stationery (Sdn Bhd) professionals may help you give opinions on business card design (in our blog) plus print professional business cards that communicate your brand name values to potential customers, business partners and additional contacts. Western Eastern (Malaysia) printing services can integrate your company’s industry and logo with business cards and other graphic design products or that will match your brand and looks just as good as printed just as it does on the computer screen (with minor colour differences). Our professionals can help you with details like adjusting business card size, business card design and styles that work best for business. Western Eastern printing shop generates a sample full-colour business card for you to approve, to get it personalised for every client, so you can end up being confident your cards is going to be satisfying. It is not only the design of your business card that can make it stand out but also printing methods that guarantee an eye-catching first impression. Ask Western Eastern Stationery staff about coloured and textured business cards, different types of paper and its general look and finishing. If you are likely serious about using technology on your business cards to enhance sales and local curiosity in your company, read more about including QR codes in your business card design. QR codes are a great way to include additional information that otherwise wouldn’t fit onto the particular standard business card size. QR codes have spearheaded business cards into the 21st century. ~ The above print cost for business cards are estimates, please contact the staff for enquiries.